Each year, Miami University Press holds a novella contest that is open to anyone wishing to submit an 18,000 -14,000 manuscript of original fiction. The winner receives some cash, a standard contract, publication, and 10 copies of the book. It’s a pretty sweet deal. I recently reviewed the 2014 winner, Fountain by Tote Hughes and was really impressed by its imagination and execution. 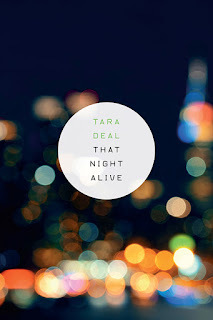 This year’s winner That Night Alive by Tara Deal, is no exception. That Night Alive exists in a seemingly post-apocalyptic world. We see it through the eyes of our narrator, a crypto-journalist diagnosed with a deadly disease. However, the novella is not about her crypto-journalism, rather it is about her waiting for her prescribed date of death and reflecting on her life and career. But it is not a somber tale either, and in fact has no traditional plot or arc as readers are used to. It jumps around in space and time as the narrator looks through a collection of paint chips and remembers her former cities and apartments, as well as the writing she never really finished. It is, essentially, a recollection of experiences and thoughts that define this character we know we will soon have to part with. The novella reads as a perfect amalgamation of poetry and prose. This is not easy to do, but Deal does it very well. One of the things I loved most about the 2014 winner, Fountain, was the ambition and execution. Many authors take on imaginative and ambitious projects, but only the great ones can pull it off. Like Tote Hughes, Tara Deal is able to accomplish this and then some. She takes a story which has no traditional plot arc so to speak, writes it as poetry, and keeps you engaged until the end, where you are left with a bittersweet sense of longing. The Miami University Press novella contest should definitely be on your radar. I have read two of the winners so far and have been doubly impressed with the imagination, ambition, execution, and artistic merit of these books. It is great to see an organization give worth and reward to literary artists outside of the mainstream. If you like poetic prose, you should read That Night Alive by Tara Deal. You will not be disappointed. You can buy it from the publisher here (also available on Amazon and B&N).